Even though Blake is sick as a dog, that is not going to stop him from going to work. Rita goes from showing concern to enjoying killing Blake. I guess the prospect of millions will do that to you. Blake is so ill he cannot focus moving forward with the pipeline. It does not help that the focusing camera work makes it appear that Blake is having blurred vision. Blake cannot handle any more at a meeting with Dominique and Adam. Dominique agrees to take over and Blake puts her in charge. It's good running the show. Dominique does manage to have a meeting with Jonathan as head of Denver Carrington. She wants to correct things in his deposition. By the way, Dominique totally was not holding a deposition - those are lengthy transcripts. This looks more like an affidavit. No matter. Jonathan uses the opportunity to tell Dominique that he adores her (again). But, the two will just keep it strictly business. Adam does not seem too concerned that Dominique is in charge even though that is his dream. He is going to get Blake to give him power of attorney. Lesson to everyone - do not show any illness around Adam because he will make you sign something for his benefit. Once Adam gets Blake to sign the document, Adam tells Claudia she does not need to be in Oklahoma to get title to that well. Claudia does not care. Adam is pissed and hangs up on her. Who cares? Adam can taste Denver Carrington. Alexis is concerned about Blake's illness for several reasons and maybe one of them is altruistic. The main one, however, is that she does not want Dominique running the show. What does Dominique know about running an oil company? She lacks Alexis's vast knowledge that has been all of about three years. Dominique refuses to deal with Alexis as equals. Adam, on the other hand, assures his mother that he will gently push his aunt aside and run the pipeline deal on behalf of Denver Carrington. Alexis, of course, wants to run it herself. I kind of wish that Galen and Michael get their country back just so they can leave Denver. Galen continues to plot and drain Alexis of her money, which does not sit well with Dex. Michael, meanwhile, is working too closely with Elena for Amanda's good. Amanda agrees to let Michael work with Elena, but she does not want to see her. So, what does Michael do? Invites Elena to have dinner with them. Amanda confronts Elena in the bathroom and Elena acts as if she is doing all of this out of shame, not for the love of Michael. In the end, Elena wins out on Michael's attention now that an entire cell has been snuffed out. Caress arrives in Denver and she heads to the newspaper morgue to get all the research she can on Alexis from the last five years. Of course the place is run by some old queen who is in love with Alexis. He fills Caress in about Blake's murder trial and Alexis's marriage to Cecil on his deathbed. It seems that no one knows for sure that Alexis married Cecil moments before he died - just a lot of rumors. Caress is intrigued. Caress does have a close call at La Mirage but is able to escape before Alexis spotted her. Joel is getting Krystle ready to bring to South America. Krystle is trying to get details so she can plot out her escape, but Joel is one step ahead of her. Joel is also several steps ahead of Rita and provides her with the final poison that will kill Blake. Rita administers the poison in his tea which she forces him to drink while he is lying in bed. Joel is not that far ahead of Sammy Jo, however. Sammy Jo knows something is up and that her plan has gotten out of control since she never wanted anyone to get hurt. Sammy Jo learns that the poison Rita had been giving Blake was to slow his heart. Rita finally breaks down and admits to Sammy Jo that she and Joel are going to kill Blake. Sammy Jo rushes to tell Steven that Blake is going to be killed. 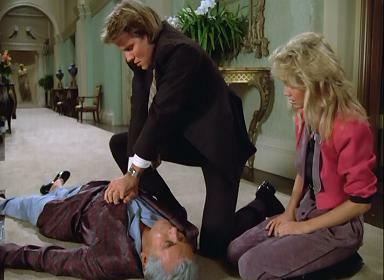 As Rita goes up the steps of the mansion, a very sick Blake reaches out to her for help, but Rita moves away. Blake collapses and rolls down the stairs. Out cold, Rita just ignores the dying Blake and continues up the stairs. Steven and Sammy Jo arrive at that moment (Rita hides) and Steven tries to save his father. Sammy Jo, meanwhile, sees the peeping Rita. Steven arrives just in time - and where is the staff when you need them? Alexis: You better look behind you because I'll be looking over your shoulder every step of the way. Dominique: That is your privilege, Alexis, but please remember, I'm used to working with a knife in my back. Adam: Well she's gone. I think she was staring at you. Alexis: It's not unusual, Adam. People do.